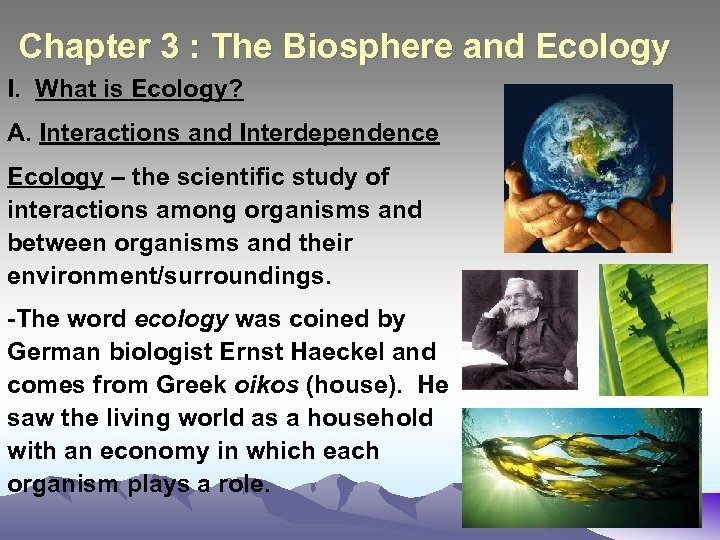 Chapter 3 : The Biosphere and Ecology I. What is Ecology? A. Interactions and Interdependence Ecology – the scientific study of interactions among organisms and between organisms and their environment/surroundings. -The word ecology was coined by German biologist Ernst Haeckel and comes from Greek oikos (house). He saw the living world as a household with an economy in which each organism plays a role. 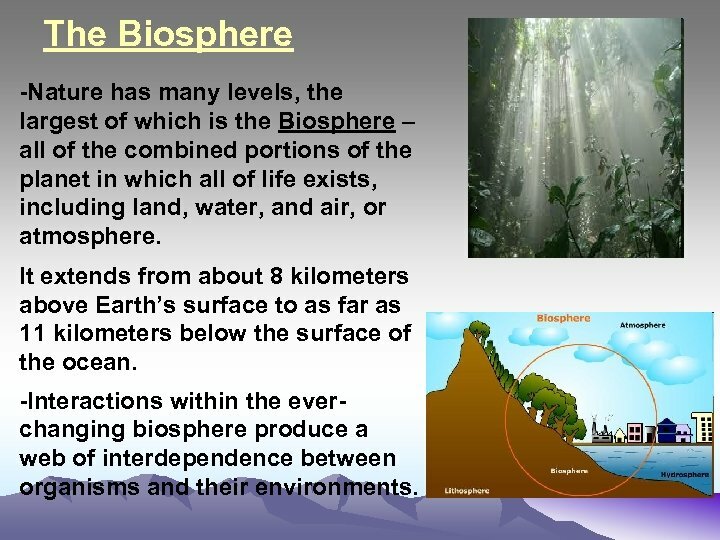 The Biosphere -Nature has many levels, the largest of which is the Biosphere – all of the combined portions of the planet in which all of life exists, including land, water, and air, or atmosphere. It extends from about 8 kilometers above Earth’s surface to as far as 11 kilometers below the surface of the ocean. -Interactions within the everchanging biosphere produce a web of interdependence between organisms and their environments. B. 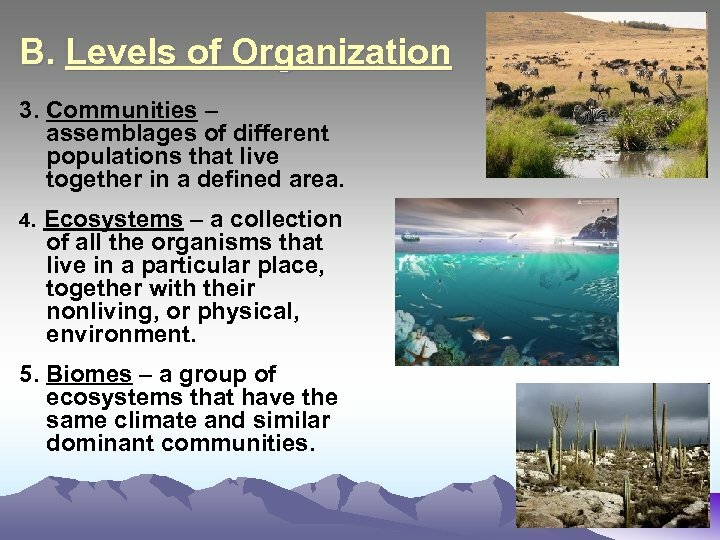 Levels of Organization *The biosphere (highest level of organization) can be broken down into 5 basic levels of organization : 1. Individuals – single organisms that can be grouped into species – a group of organisms so similar to one another that they can breed and produce fertile offspring. 2. Populations – groups of individuals that belong to the same species and live in the same area. B. Levels of Organization 3. Communities – assemblages of different populations that live together in a defined area. 4. Ecosystems – a collection of all the organisms that live in a particular place, together with their nonliving, or physical, environment. 5. Biomes – a group of ecosystems that have the same climate and similar dominant communities. C. Ecological Methods *Scientists conduct modern ecological research using three basic approaches : 1. 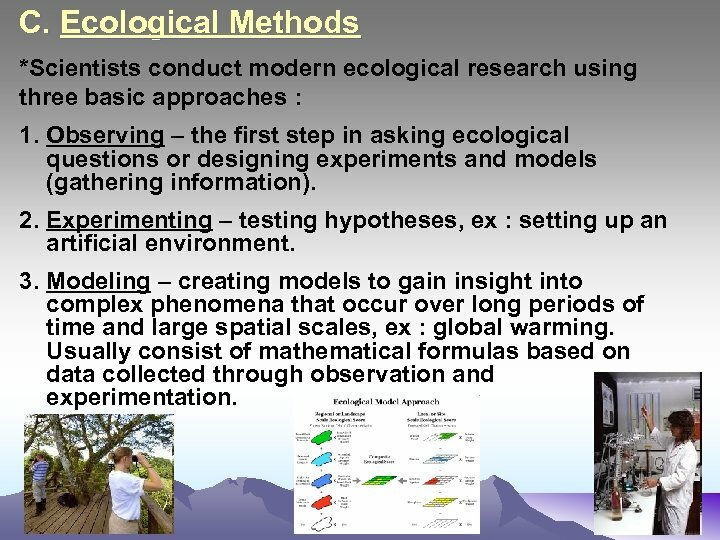 Observing – the first step in asking ecological questions or designing experiments and models (gathering information). 2. Experimenting – testing hypotheses, ex : setting up an artificial environment. 3. Modeling – creating models to gain insight into complex phenomena that occur over long periods of time and large spatial scales, ex : global warming. Usually consist of mathematical formulas based on data collected through observation and experimentation. II. 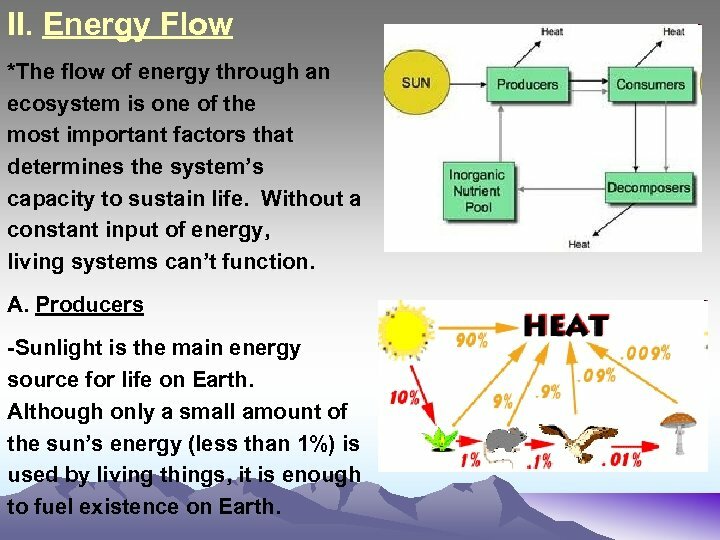 Energy Flow *The flow of energy through an ecosystem is one of the most important factors that determines the system’s capacity to sustain life. Without a constant input of energy, living systems can’t function. A. Producers -Sunlight is the main energy source for life on Earth. Although only a small amount of the sun’s energy (less than 1%) is used by living things, it is enough to fuel existence on Earth. Producers Con’t. 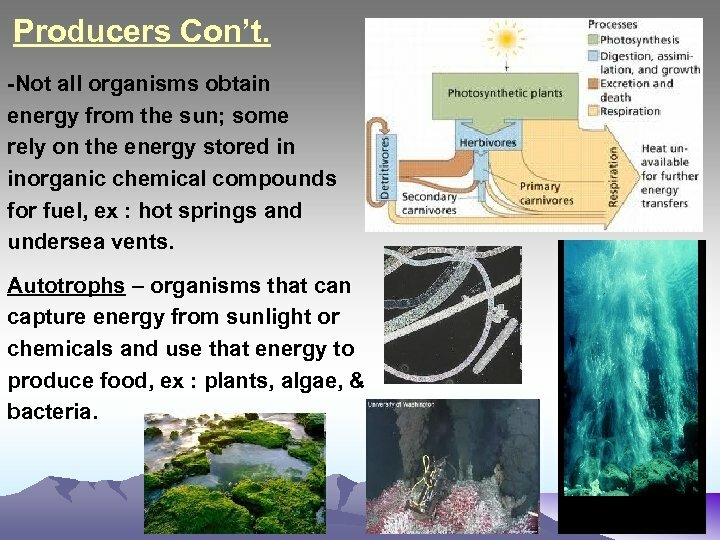 -Not all organisms obtain energy from the sun; some rely on the energy stored in inorganic chemical compounds for fuel, ex : hot springs and undersea vents. Autotrophs – organisms that can capture energy from sunlight or chemicals and use that energy to produce food, ex : plants, algae, & bacteria. Autotrophs -Autotrophs use energy from the environment to take simple inorganic compounds and turn them into complex organic molecules. These molecules combine and recombine to produce living tissue. 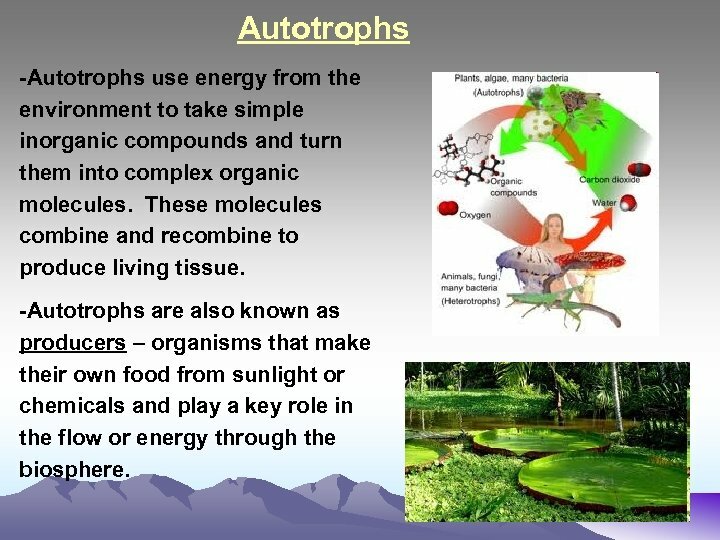 -Autotrophs are also known as producers – organisms that make their own food from sunlight or chemicals and play a key role in the flow or energy through the biosphere. 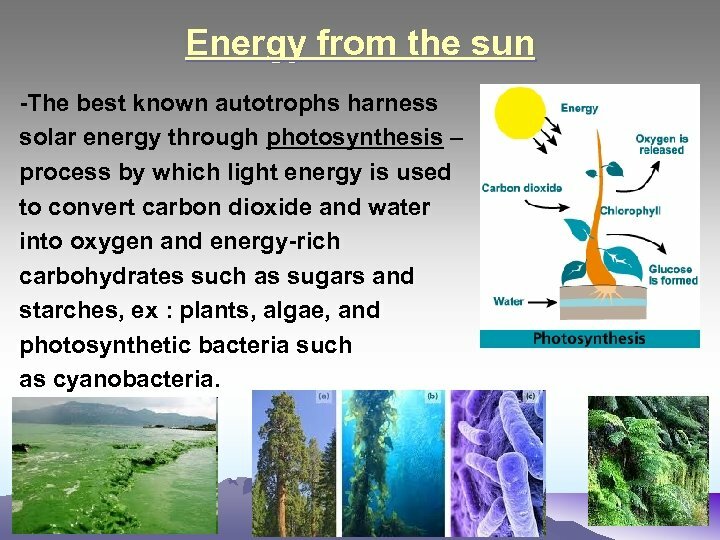 Energy from the sun -The best known autotrophs harness solar energy through photosynthesis – process by which light energy is used to convert carbon dioxide and water into oxygen and energy-rich carbohydrates such as sugars and starches, ex : plants, algae, and photosynthetic bacteria such as cyanobacteria. 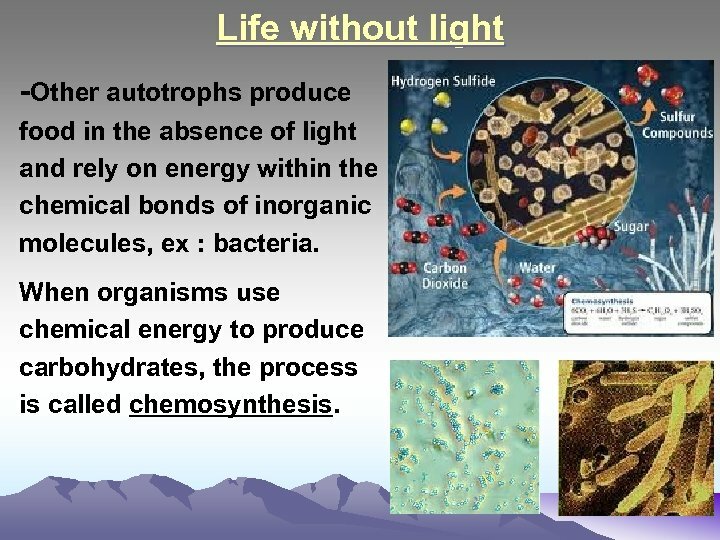 Life without light -Other autotrophs produce food in the absence of light and rely on energy within the chemical bonds of inorganic molecules, ex : bacteria. When organisms use chemical energy to produce carbohydrates, the process is called chemosynthesis. B. Consumers *Organisms that cannot harness energy directly from the environment must acquire energy from other organisms. Heterotrophs – organisms that rely on other organisms for their energy and food supply. Heterotrophs are also referred to as consumers. 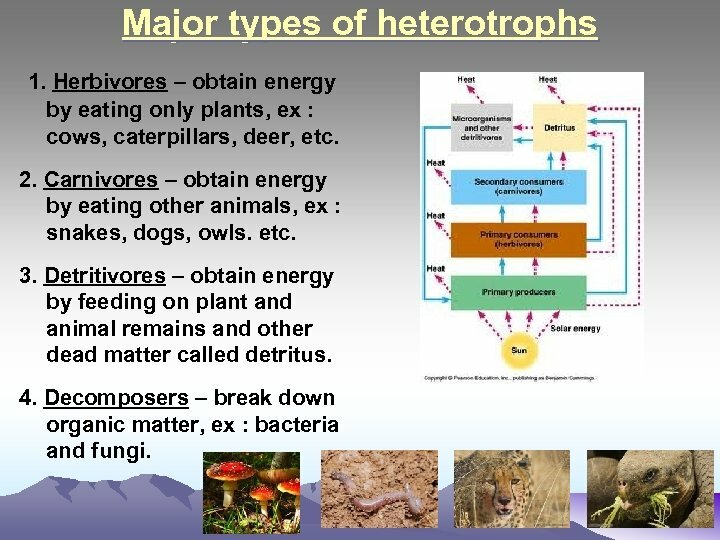 Major types of heterotrophs 1. Herbivores – obtain energy by eating only plants, ex : cows, caterpillars, deer, etc. 2. Carnivores – obtain energy by eating other animals, ex : snakes, dogs, owls. etc. 3. Detritivores – obtain energy by feeding on plant and animal remains and other dead matter called detritus. 4. Decomposers – break down organic matter, ex : bacteria and fungi. 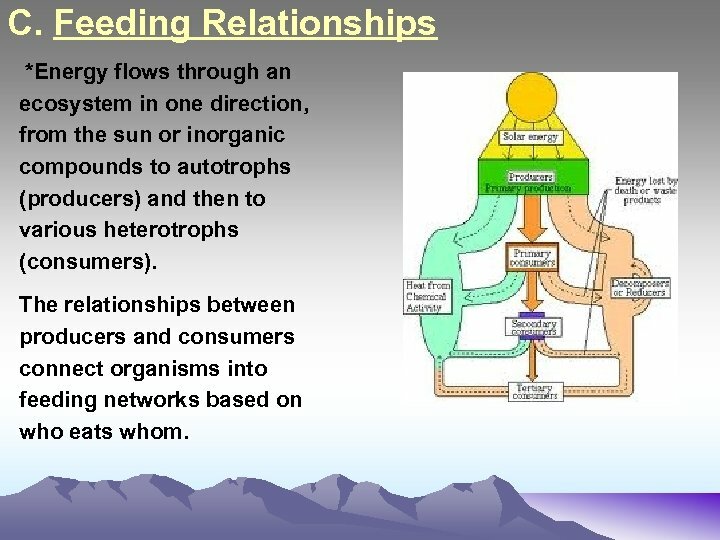 C. Feeding Relationships *Energy flows through an ecosystem in one direction, from the sun or inorganic compounds to autotrophs (producers) and then to various heterotrophs (consumers). The relationships between producers and consumers connect organisms into feeding networks based on who eats whom. 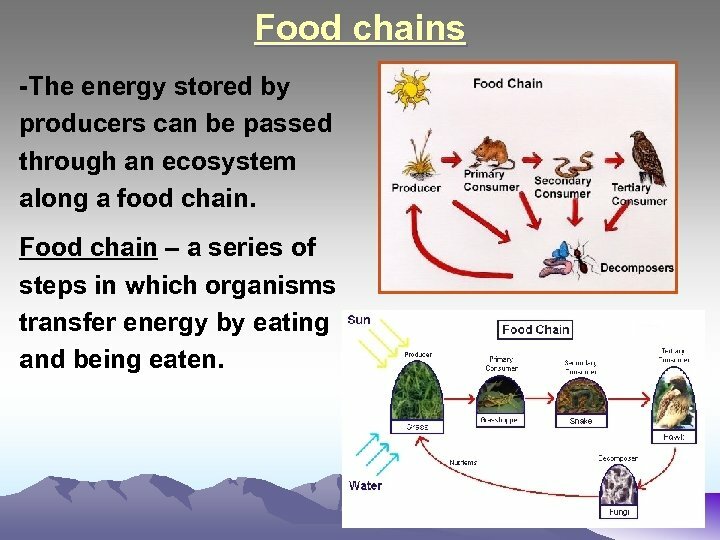 Food chains -The energy stored by producers can be passed through an ecosystem along a food chain. Food chain – a series of steps in which organisms transfer energy by eating and being eaten. 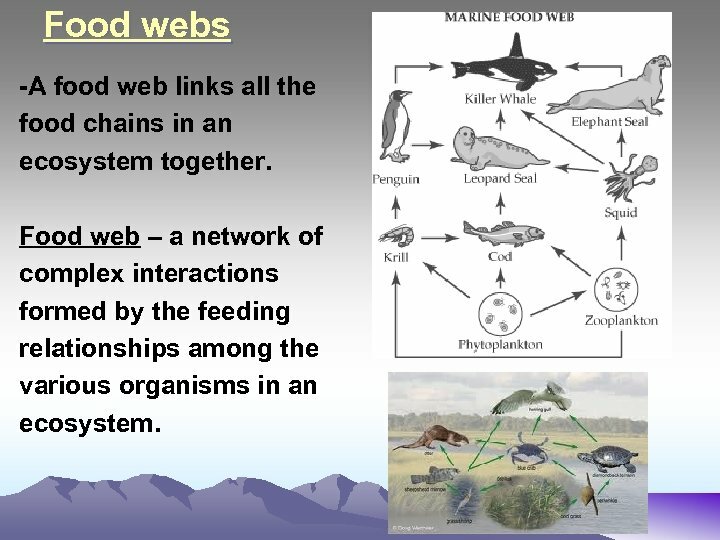 Food webs -A food web links all the food chains in an ecosystem together. Food web – a network of complex interactions formed by the feeding relationships among the various organisms in an ecosystem. 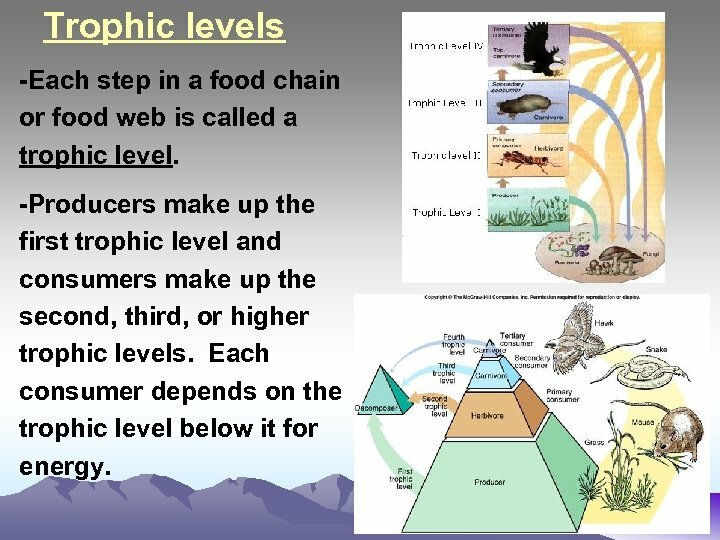 Trophic levels -Each step in a food chain or food web is called a trophic level. 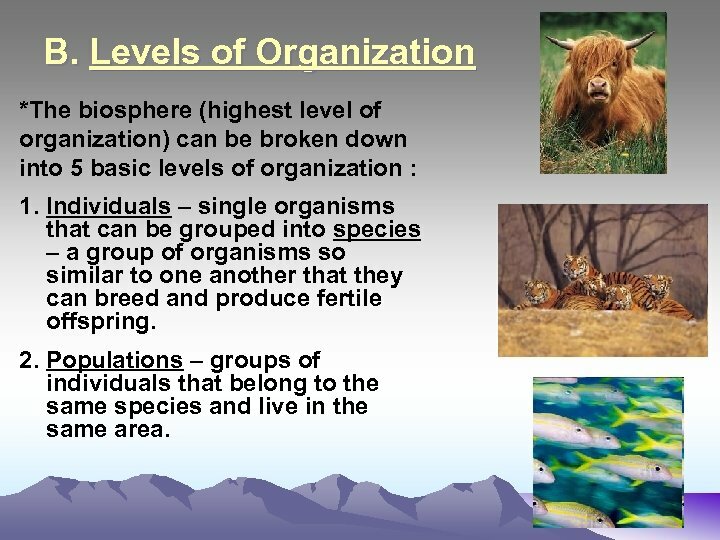 -Producers make up the first trophic level and consumers make up the second, third, or higher trophic levels. 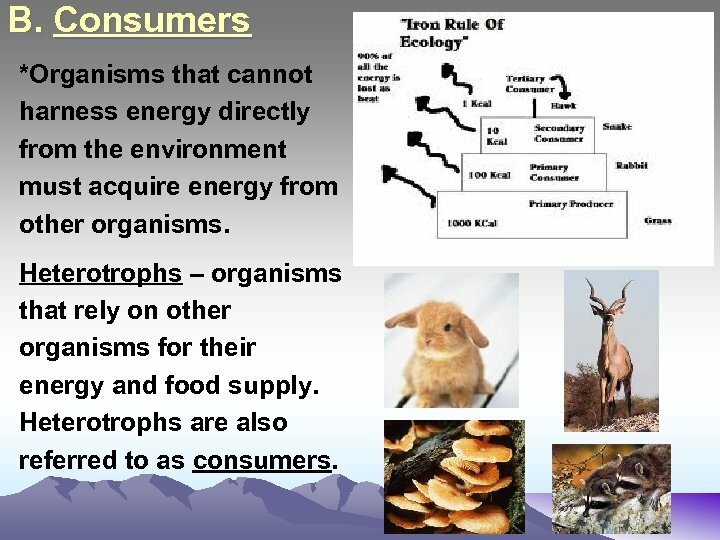 Each consumer depends on the trophic level below it for energy. 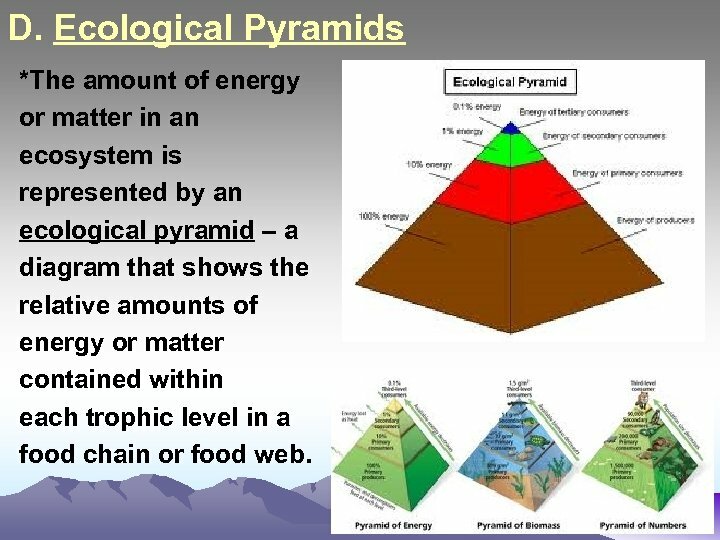 D. Ecological Pyramids *The amount of energy or matter in an ecosystem is represented by an ecological pyramid – a diagram that shows the relative amounts of energy or matter contained within each trophic level in a food chain or food web. 3 Types of Ecological Pyramids 1. Energy pyramid – pyramid showing the relative amount of energy available at each trophic level. Organisms use about 10 percent of this energy for life processes and the rest is lost as heat. -The more levels that exist between a producer and a top-level consumer in an ecosystem, the less energy that remains from the original amount. 3 Types of Ecological Pyramids 2. Biomass pyramid – pyramid representing the amount of living organic matter at each trophic level. Typically the greatest biomass is at the base of the pyramid. Biomass – the total amount of living tissue within a given trophic level. 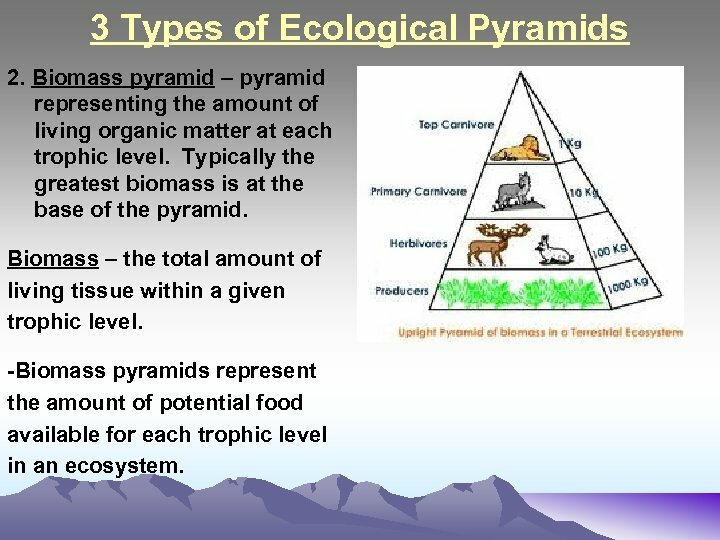 -Biomass pyramids represent the amount of potential food available for each trophic level in an ecosystem. 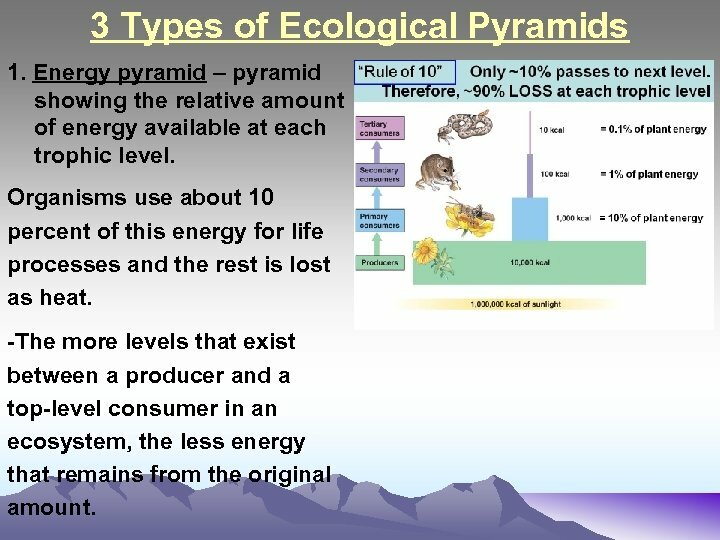 3 Types of Ecological Pyramids 3. 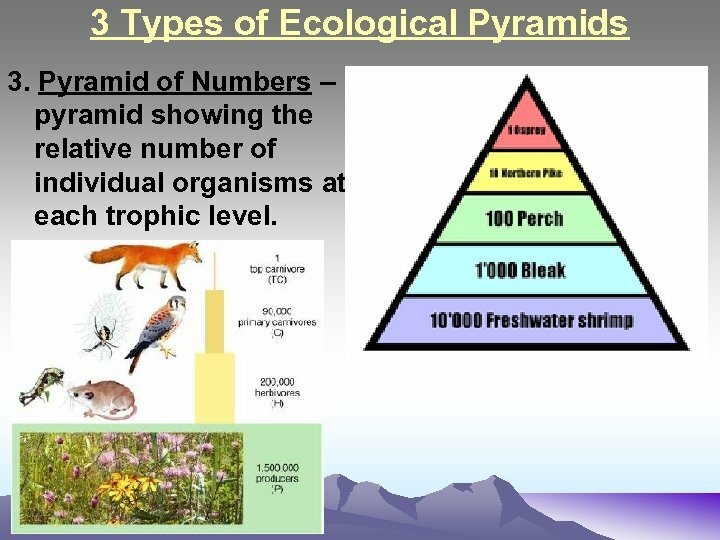 Pyramid of Numbers – pyramid showing the relative number of individual organisms at each trophic level.